Porto hosted the portuguese WordCamp 2013 last weekend and luckily I was there! It’s hard to write about this WordCamp, after having attended to the inspiring WordCamp Europe in October. Porto hosted the portuguese WordCamp 2013 last weekend and luckily I was there! 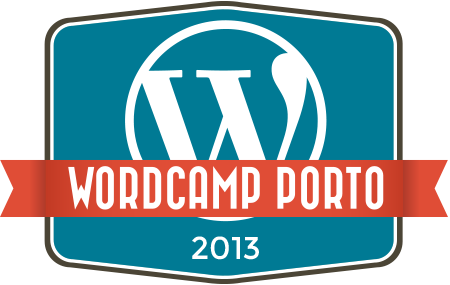 It’s hard to write about this WordCamp, after having attended to the inspiring WordCamp Europe in October. Though, it’s so nice to feel that the WordPress portuguese community is alive and bubbling, and this is why WordCamp Porto was a success! Hugo Baeta challenged us to go back to the basics, feel the feet on the ground, and realize that WordPress core already delivers 80% of the features needed for some projects, before flooding the installation with lots of plugins. Indeed, some plugins are really keen, like Advanced Custom Fields, which is a lifesaver. Well done! Ana Aires transported us to the difficult world of client’s interaction. Although not completely related with WordPress itself, it reminded all of us that we, as freelancers or business owners, need to punch our businesses in the best direction possible as our first priority. And this is possible by adding value towards our client as one of the most important drives to accomplish success. Thanks to Ana, we at GOMO are already changing some client approaches and, incredibly, we are having short term results! Good signs… Thanks Ana! Ana Neves and Hugo Fernandes, in two different talks, pushed our boundaries in different directions. Ana Neves used different presentation angles in a journey of destroying to recreate, and shown us that WordPress is also a great framework to publish our traditional old-school PDF reports into living web documents. On another angle, Hugo (as in WC Lisboa 2012) smashed our straight and narrowed line of thinking, and invited us to fight with our creativity for our dreams and ideas! Daniel Kanchev scratched our WordPress security barrier showing us several ways to hack a WordPress site. It was a tragicomedy presentation, as I was immediately compelled to turn on my laptop and secure all my clients’ websites. Turns out that by choosing strong passwords, not using ‘admin’ username and keeping WordPress core, themes & plugins updated is 99% of path for a secured website. And I could continue writing about the other speakers which were brave enough to share their point of view with us. Thank you all. Well, as Zé Fontainhas pointed out, we need to boost WordPress Portugal community to become more than a translation group. So, he challenged all to be more active in the community, to meet more, and overall to give back: “everything that we don’t give back will be lost forever”. Hi Ana, it was great to see a simple usage of WordPress yet so powerful. Thanks for sharing that. Hi Luís thanks a lot for you kind words. It’s great to know that you did tried and that in such a short time you already see some results. Value is a powerful thing 🙂 It was great pleasure to be part of WordCamp Porto. Thanks again for your feedback!